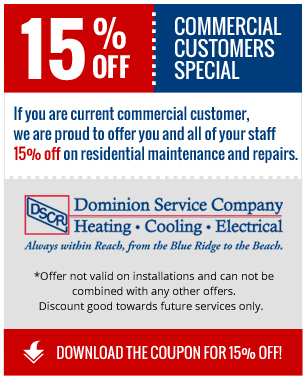 Whether you are already a customer or new to considering Dominion Service Company, we offer savings discounts in addition to all the great core values and service we provide! New residential customers: save $30 on your tune up service from DSCR. Maximize the lifespan of your HVAC unit with our 26 step Ultimate Precision Tune-Up! This discount is for new residential customers only and is not valid if combined with any other offers. This limited time offer expires May 30, 2019. 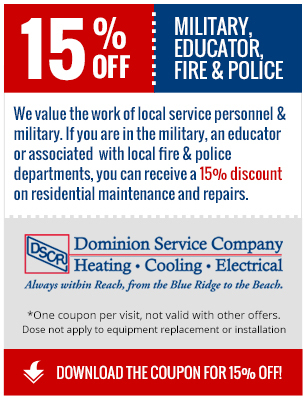 New residential customers: save 15% on HVAC service repairs in your home with Dominion Service Company. Let us show you why homeowners rely on DSCR! This discount is for new residential customers only and is not valid if combined with any other offers. This limited time offer expires May 30, 2019. If you are a current customer with a commercial maintenance agreement, we are proud to offer you and all of your staff 15% off parts, labor, and repairs at your home*. Not a current commercial customer of ours? Perhaps our 15% offer can entice you to give us an opportunity to earn your business, both on the job at a home! To learn more, see the full offer. Contact Dominion Service Company Today! Beyond our honest recommendations, timely service and 100% satisfaction guarantee, we also offers discounts to our customers with regular service agreements! Contact Dominion Service Company online or call our main office at 1-800-832-0758 to learn more about our specials offers!